Researchers across the globe are experimenting with ways to use artificial intelligence and other high-tech means to detect cancer. At the same time, one startup in Florida is taking a decidedly low-tech approach to the problem by turning over the task of sniffing out cancer to dogs — and the animals, the company says, are surprisingly good at it. 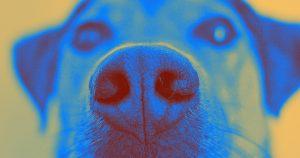 On Monday, Florida’s BioScentDx presented its study of canine cancer detection at Experimental Biology, a life sciences and biomedical research conference. For the study, the researchers used a behavioral technique called “clicker training” to teach four beagles to differentiate between healthy blood samples and ones taken from people with malignant lung cancer. One of the dogs, Snuggles, was “unmotivated to perform,” according to a press release (relatable, right?). But the other three averaged a 96.7 percent accuracy at identifying the lung cancer samples and 97.5 percent accuracy at spotting the healthy samples. According to researcher Heather Junqueira, the team sees two ways scientists could harness this puppy power to detect cancer.